If you are a parent, or have little ones in your lives, chances are the noise level in your house can sometimes feel like its own endless entity. Annoying electronic toys, banging pots & pans, tooting kazoos… Let’s face it, the more sound something makes, the more your little love is going to adore it. 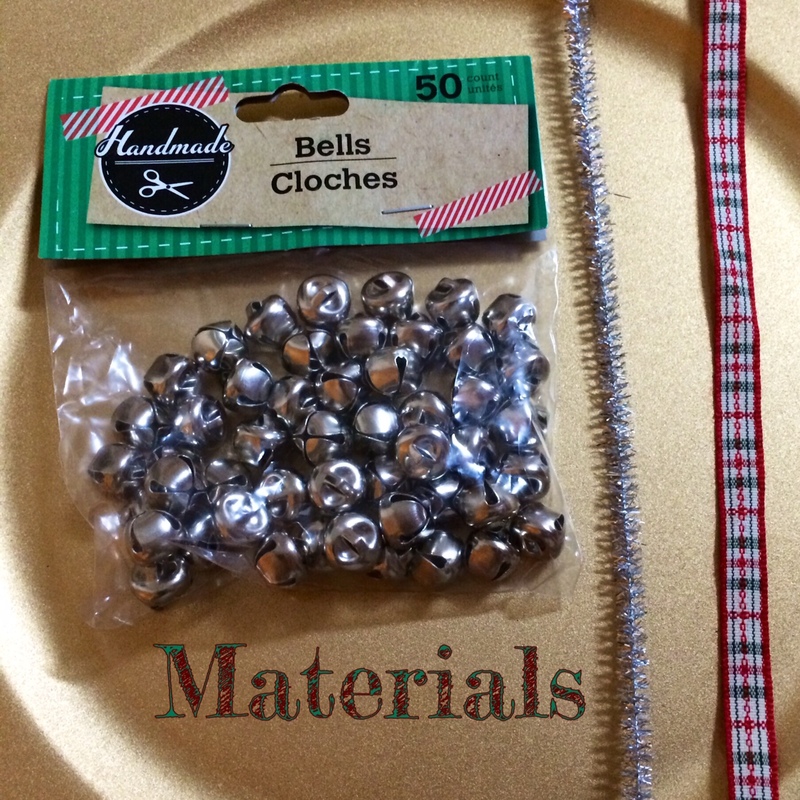 What if I told you there was a fun way to make an ornament project that will quell your little one’s need for noise in a way that won’t split your head open? The key to this project is the miniature nature of the jingle bells used. (Tiny bells = tiny noise!) For this reason, along with the dexterity and hand-eye coordination required that may be beyond toddler level, this craft may be inappropriate for children under 3 years old. That said, if you have a bit of patience and want something to do hand-over-hand, this is a good place to start! *Note: This is a GREAT project for all ages and particularly for those working on fine motor skills. (Occupational Therapists and care/skilled nursing/assisted living home staff take note!) The creation of these ornaments is sheer practice in stringing skills. 1 pipe cleaner – Pipe cleaners are a craft room staple. They are so useful for so many things! Nowadays they come in all sorts of colors and textures. I spent a dollar on an entire package of sparkly ones in shades of silver, gold, pink, and blue… this time from Target. These should also be widely available at dollar stores. What’s even better is that they are so simple to make! Looking closely at the bells, you will notice that there is a slight notch cut out from the top. 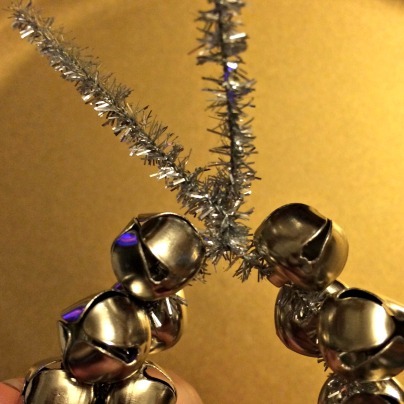 Push the pipe cleaner through the notch, stringing the bells into a straight line. (It looks even better, and frees up room for more bells, if you turn them to face the opposite way each time.) To make this easier, you may want to lay the pipe cleaner flat on a work surface. Warning: It is easy for the pipe cleaner to “slip” and go into the actual bell. Just a small bit of encouragement can help quell frustration in your crafter! Let them know how good of a job they are doing, no matter how old they may be! If you want to create an ornament for hanging, leave 2 inches or so unstrung at the ends of the pipe cleaner. This allows you to bring them together at the top, bending the whole bells structure into a circle. 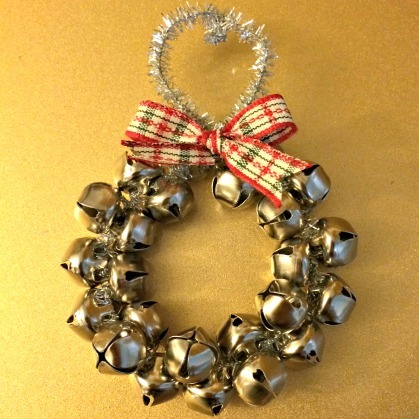 Give it a twist or two to create & secure the wreath shape. Twist the remaining ends together at the very top (leaving you with a hanging loop for a branch). For a fun finishing touch, tie a small piece of ribbon into a bow over the wreath twist. So for around $2 ($3 if you want to buy some ribbon), you can make at least 2 of these fun little guys. They make great presents for teachers, grandparents, friends, neighbors, the mailman, the babysitter… or just a nice addition to the tree. 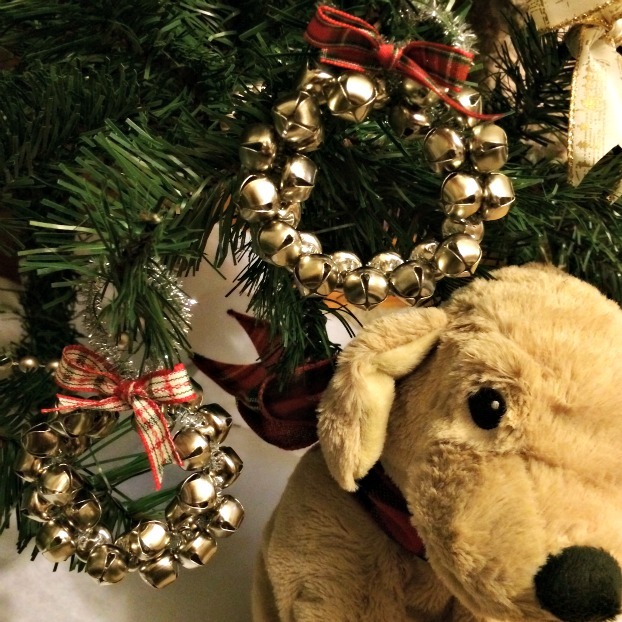 Just be sure that if you do have little ones in the house, you do not leave them unattended with the ornaments or supplies as the bells are most definitely small enough to be a choking hazard. 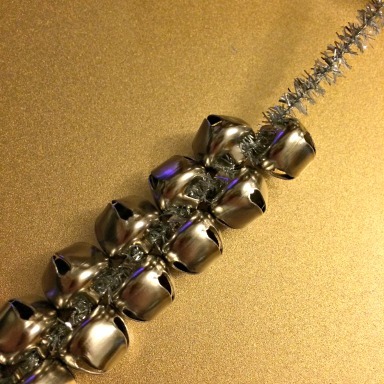 Have a jingling good crafting time! P.S. This ornament is featured on my Downton Abbey Servants’ Hall Christmas tree. It serves to represent William, the war fallen footman who brought his musical talents to liven up the downstairs in Series 1 & 2. For a closer look at the tree, visit Buzzfeed. Tags: activities director, activity, affordable, after school, art, assisted living, care home, cheap, children, community, craft, crafting, crafts, crafty, cute, dexterity, diy, easy, enrichment, fast, fine motor skills, fun, kids, music, nurse, nursery, nursing home, occupational therapy, ot, project, school, skilled nursing, teaching. Bookmark the permalink.